First, we decreed a release date for Julie McGowan's "The Mountains Between", and it was all systems hundelay! to prepare the manuscript for printing, design the cover, make all the arrangements, and do a slew of pre-publicity to prepare Wales for this fantastic book. Julie was (and is!) fantastic at all kinds of things - contacts, ideas, talks, interviews, and just plain hard work. We are very blessed to have her as our first author; she has, I fear, spoiled us for whoever else may yet come! On 27th November was the launch party, held at the beautiful old Sessions House in Usk, Wales. Julie and her talented family and friends had arranged a wonderful program of music and readings; the venue was packed with people, including several from the media (see, for instance, the photospread in County Times Magazine, and other coverage in the Western Mail, Argus, and others). It was great fun, and the next day we drove on to meet another Welsh author with whom we are hoping to sign a contract in early 2008 - watch this space; he is a VERY exciting writing talent! 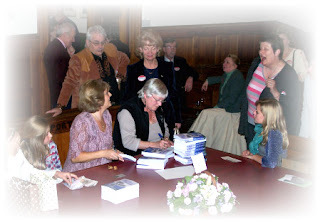 Julie (in rose lace) signing copies of her book at the launch. Another mountain - the 'flu! I did, however, pick up 'flu whilst there, and by the weekend felt rather as though I might not see Christmas at all ... and of course by Monday, hubby had nursed me so well he'd got it himself. And here we are, mid-December, still both sick, though I am very happy to discover that yesterday I think I turned the corner toward a slow recovery. Availability of "The Mountains Between"
Despite the 'flu, life does go on, and we've worked hard at following up the orders for "The Mountains Between", supplying customers, and being accepted by Bertrams distribution - a HUGE milestone for us, as it means the book will shortly become available in the major chain stores like Waterstones, WH Smith and Borders. We believe from customers that at present, those large chains can't be bothered going further than their computers to check their listings, and if it's not on there they simply say it's not available. Untrue! Bertrams were shocked to hear this, since even before it was on their listing, they had taken individual orders from independent booksellers for it. Apparently if your local large chain bookstore is telling you they can't get it, they're - ummm - using a terminological inexactitude, to quote the great Churchill (as he tactfully avoided using the L-word in Parliament). Examples of bookshops that have it in stock right now: Mandalays in Usk; Brownings in Blaenavon; Abergavenny Bookshop ... (note to book sellers: if you would like to stock this book, it's available at normal wholesale discounts, SoR, directly from us, or from Bertrams distribution). Or, of course, you can order directly from our web site at www.sunpenny.com - no postage is charged. There is still time to order for Christmas; if you order by Wednesday 19th, you will receive it by Friday or Saturday - or if the Post Office is slow, by 24th December. We do post out either the day of receiving the order (if it's before 2pm), or the next morning. But I digress. So: the push to let the world know about this fabulous book is working; orders are flying in, and we're foreseeing a second print-run in the near future. We are also getting GREAT feedback; people are loving the book, and coming back for more and more copies to give to friends! So far we have only let South Wales in on the secret, but we are about to publicise it to the rest of Wales, and the UK. Next year ... the World! Aaaaahahahahahahah!! In between all this, we were judging the September-deadline writing competitions. Five of us were involved in the judging process, and every entry was read by at least three people. The top entries were then read by our guest judge, Lucy McCarraher, and we were quite proud that despite all our busy-ness and the 'flu, we managed to get the winner announcements up on the web site only a week later than we'd aimed for. Prize cheques have been sent, and the prize books will be in the post on Monday (20th). We hope everyone is delighted with their winnings! We had a low number of entries, due we suspect to the fact that we are new on the scene and many people weren't sure whether to trust themselves to our competitions. This meant that most of the prize money wasn't covered by the entries, but no matter - our enthusiasm for encouraging writers is boundless, and we paid out very happily! The winning entries, details of our winners, and our Commendations and their authors, are all presented at our web site. We were delighted, on the whole, with the high standard of the entries! Christian - as before, with restriction as for the Open writers' competition. Closing date for entries is 31st March (for all competitions), and winners will be announced at the end of May 2008. Best entries will go into an anthology of short stories, which will hopefully be published in time for Christmas 2008 - a great Christmas gift! All details for our writing competitions can be seen at www.sunpenny.com - please do read guidelines before entering. We have also put up a Judges' Comments page based on the entries we received for the September competitions - lots of tips and information on what to do, and not to do, when entering competitions. Things to consider; we hope they're helpful to you. 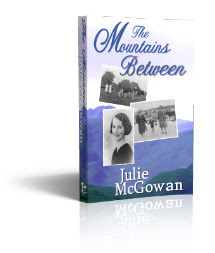 Buy "The Mountains Between" - it's a wonderful book! And have a wonderful Christmas and New Year season. Rest! Enjoy! does the competition limits for writers in a certain region?